“We see qualities in VR/AR technology that can take this from niche-use case to a device as ubiquitous as the smartphone,” Goldman Sachs Research wrote in its Virtual and Augmented Reality report. More consumers are expecting to see the power of virtual reality too. According to Greenlight Insights 62% of consumers say they would feel more engaged with a brand that sponsors a VR experience and 71% of consumers think a brand is forward-thinking if it uses virtual reality. Sarah Hill is the CEO and chief storyteller for StoryUP, one of the early pioneers in virtual reality for brands. 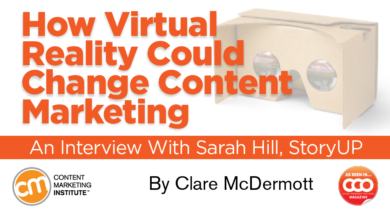 She explains why VR is finally gaining a foothold, and what marketers should understand before they dive in. CCO: Describe what virtual reality applications look like today versus what they’ll look like in the future? Where is the technology headed? Hill: Today we are in the “brick-cell-phone phase” of VR. Mobile VR is taking off – by that I mean you don’t need a heavy-gaming PC to view VR; all you need is your mobile device and Google Cardboard. Yet most VR experiences are seated right now. The future is walk-around VR or what’s called “room-scale VR,” where you can move around a virtual room. Imagine walking around a Walmart virtual showroom in your bedroom and using hand controllers to add items to a virtual shopping cart or browsing virtual clothing racks at Target. VR is predicted to disrupt nearly every industry, but in particular education, travel, journalism, health care, architecture, and yes, even marketing. The world is no longer flat. The internet is fast-becoming a place you step inside. Just as you had to make your site responsive for mobile, so too will you have to make it responsive for VR. CCO: Marketers sometimes get excited about a new technology or new channel, and race to use it before figuring out fit or strategy. Can you offer pointers for those considering undertaking a virtual reality project? Hill: There are certain kinds of stories that naturally lend themselves to virtual reality. First and foremost, in VR location is a character so you want to choose stories that have immersive environments or create one. You also want to choose a storyteller who’s experienced with crafting non-linear story arcs with immersive media. In an immersive story, the viewer is in control of the frame, not the storyteller – which means you need to use subtle techniques (e.g., visual cues and positional audio) to direct the audience where to look. It can be incredibly frustrating to the viewer if it’s not clear where they should be directing their attention. Be wary of including camera movements in your VR story. Movement in VR is something that can make the audience feel sick. Hire a professional company that’s completed a lot of VR experiences, as hiring inexperienced people might result in something that could put your customers on the vomit train. CCO: When considering a VR partner (i.e., studio), what questions should marketers ask? How many experiences have they created? Many studios are new, but even new entrants should have at least a half-dozen immersive items on their sizzle reel to show you. Find out if the story will be monoscopic (2D) or stereoscopic (3D). Not every 360-degree story has to have 3D or depth. 2D, 360 stories – when well told and produced – can rival any 3D experience. The problem with 3D is that people don’t always know how to perceive depth. They see the 3D, 360 video and think, “that’s blurry.” It’s not blurry. The viewer is perceiving depth, but doesn’t always know how to process that kind of content. It’s up to you: you can play it safe and go 2D, 360. Or if you have a bigger budget and the shop you hire can procure high-quality proprietary camera rigs, shoot for the moon. CCO: Can you give a ballpark cost of VR video compared to a normal video? Hill: A VR video costs at least three times that of a regular video because it requires multiple cameras and because you have to stitch together frames with multiple software programs, and lots of post-production and rendering. I always joke VR is like sausage. Everyone wants to consume it but no one wants to see it being made. It’s a messy, complicated process that taxes your computers to the max. The exact cost really depends on the project, and whether you’re hiring a company from the coasts or from the Midwest. In the Midwest, our experiences range anywhere from $35,000 and up, not including travel. The camera rig we use also influences the price. Before I started my company, I got a quote on what it would cost to create a VR experience at the World War II Memorial; the bid came back at a half-million dollars! CCO: You’re immersed in the world of VR. What excites you most about it? Hill: The ability to lift spirits with VR. We’re doing research about how VR affects brain waves and how it has the ability to quiet the brain. We’re categorizing our stories on the basis of brain reactions like hope, joy, motivation, and empathy. People don’t just watch a VR story; they feel it. As a storyteller, that’s an incredibly useful piece of data. Story combined with VR is a powerful tool for calm, joy, and empathy. Hill: Monoscopic VR content is a 360 video presented in 2D. You stand at the center of a sphere and can look in all directions to see the world (real or imagined) around you. As you move, the camera moves with you. The image you see, however, resembles traditional video content. This MythBusters’ VR tour of a shipwreck in shark-infested waters is monoscopic VR. Stereoscopic VR content is 360 video presented in 3D, meaning the images before you can be much more life-like and immersive. The problem, however, is that stereoscopic VR is much more challenging to produce, much less forgiving of errors, and worst of all, can cause severe nausea if done improperly. Felix and Paul Studios shares several of is stereoscopic VR projects on its site. Honor Everywhere offers terminally ill veterans free virtual-reality “flights” to see the war memorials in Washington, D.C. StoryUP is currently looking for partners to grow the program, as well as volunteers with headsets willing to share VR at local veteran homes or assisted-living centers. Zenith Aircraft Company sells kit planes and wants to give customers who can’t travel to its facility for a demo flight the ability to experience it. StoryUP created a virtual-reality experience for Zenith as well as a social campaign. Not only was the video highly watched and shared, the cost per impression was lower – meaning the project used advertising dollars more efficiently. Plus, Zenith saved on the cost of jet fuel for customers who ordinarily would request a demo flight. Looking for more ways to maximize the impact of your VR/AR content? Get practical insights, advice, and answers in our 2018 Guide to Essential Content Marketing Tactics.